The story begins in the 1950s, in a poor but vibrant neighborhood on the outskirts of Naples. Growing up on these tough streets the two girls learn to rely on each other ahead of anyone or anything else. As they grow, as their paths repeatedly diverge and converge, Elena and Lila remain best friends whose respective destinies are reflected and refracted in the other. They are likewise the embodiments of a nation undergoing momentous change. Through the lives of these two women, Ferrante tells the story of a neighborhood, a city, and a country as it is transformed in ways that, in turn, also transform the relationship between her protagonists, the unforgettable Elena and Lila. 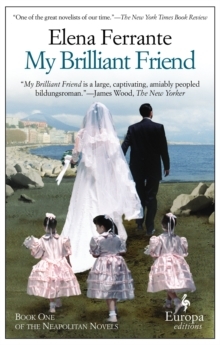 Ferrante is the author of three previous works of critically acclaimed fiction: The Days of Abandonment, Troubling Love, and The Lost Daughter. With this novel, the first in a tetralogy, she proves herself to be one of Italy’s great storytellers. She has given her readers a masterfully plotted page-turner, abundant and generous in its narrative details and characterizations, that is also a stylish work of literary fiction destined to delight her many fans and win new readers to her fiction.